Senator, eight division world champion and “Fighter of the Decade” Manny Pacquiao had a final workout with Hall of Fame trainer Freddie Roach at the Wild Card Gym in Los Angeles before driving with the members of his entourage to Las Vegas where he will go after a third WBO welterweight title against two-division champion Jessie Vargas on Sunday, Manila Time. Boxing Scene reports that Pacquiao and Vargas “will go mano a mano and toe-to-toe in a high-stakes welterweight showdown. His intention is to put on a compelling performance and become the first Senator to win a world boxing title which would hopefully lead to a rematch with Floyd Mayweather Jr who scored a unanimous decision when they first met in May 2015. Reports from Las Vegas indicate that Mayweather who has been back in the his gym as he always does to stay in shape, is likely to follow the action with interest and hopefully make a decision on whether to give Manny a rematch so he could beat the 49-0 record of heavyweight champion Rocky Marciano. However, former two division world champion Gerry Penlosa who has intently watched Pacquiao train, believes the Filipino southpaw is in devastating form and Vargas’ dream of knocking out Pacquiao will turn into a nightmare as he himself will be knocked out by Manny. Interest in the fight and the showdown between WBO super bantamweight champion Nonito “The Filipino Flash” Donaire and unbeaten challenger Jessie Magdaleno has been building up and Top Rank promoter Bob Arum believes the pay-per-view numbers will be good. Pacquiao, like he promised, didn’t miss a day at the Senate. Sometimes he would be at the office for 14 hours and then get a sparring session in with Roach to end the day. Pacquiao would end his nights by playing a game of chess and wake up at 5 a.m. for a long run before heading back to the Senate. 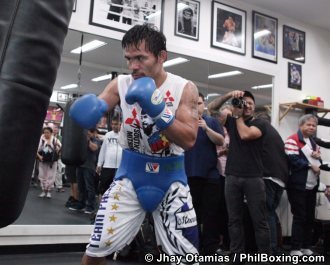 Photo: Manny Pacquiao hits the heavy bag during his final workout at the Wildcard Gym in Hollywood before leaving for Las Vegas Monday afternoon. Photo by Jhay Otamias / PhilBoxing.com.